Creation Ex Nihilo Technical Journal, vol. 12, no. 1, 1998. A decade of debate over the proposition that the historical measurements of the speed of light show that the speed of light has decayed is reviewed. A number of articles have appeared in this and other journals in which both creationist and secular authors have contended that the speed of light has not decreased. This article seeks to point out some of the fundamental flaws of logic and unacceptable lines of argument that some of these papers contain. Despite the confident claim by the critics that speed of light decay is now refuted, I would contend that such criticisms are the result of a faulty approach to the subject. 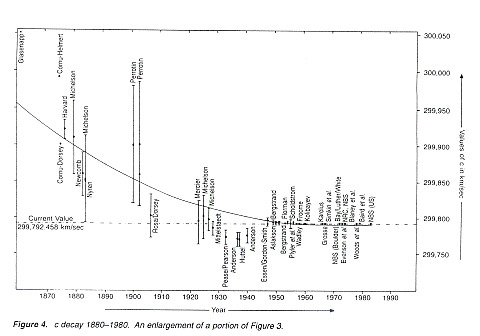 Speed of light decay is not only still viable but well supported by the data. I have had an interest in the speed of light decay (CDK) debate almost since it was first raised by Setterfield in 1981. I became convinced that CDK had taken place, but still examined the evidence as critically as I could. I had several exchanges of correspondence with Setterfield and saw that he was well able to answer my questions and those of his more qualified critics. It is therefore with growing concern that I have read the increasing criticisms denying that CDK ever took place. The more recent anti-CDK articles that have appeared in the CEN Technical Journal (1,2) have not been rebutted by its protagonists, and therefore many readers, baffled by the statistics, will conclude that the critics have the better case, that the protagonists have been routed and that CDK can be ignored. I will try to summarise the debate and to show that CDK is far from disproven. I will here mention that efforts to find the curve that CDK has followed have no bearing whatsoever on whether the speed of light has decreased or not. We will therefore concentrate only on the more important issue. The shape of the curve can only be explored after CDK has been proven. To cover the ground quickly and succinctly, I will examine specific points as follows. There have been many contributors to the debate, but the main contenders are Setterfield, Norman, Dolphin and Montgomery supporting CDK, and those against are Aardsma, R. H. Brown, Humphreys and Evered. The main papers I will be referring to are given in the references. This is the main point of the discussion between the contenders as to what is, and what is not, an acceptable statistical method of analysing the data. In their main work, Norman and Setterfield (3) could see that the values of c (the speed of light) increased on a curve as you went back in time. To find the best fitting mathematical curve they tried several, and eventually found that a critically damped curve gave the best results. This was done by choosing a curve and seeing how far it departed from the actual values. At each value, this difference was noted, each was squared, and all the results were added together. The better the fit, the smaller these differences were. Therefore there was a figure that showed which curve gave the best fit. The first criticism of this method was presented by Aardsma. (4) He proposed that those results that had a large error (that is, the less accurate measurements) should not have the same importance as those that have small errors (that is, highly accurate). This appears to be a very reasonable correction that should be applied to the values. When he did so, he found that there was virtually no decrease in the speed of light. Why should this be? The answer lies in two aspects of his analysis. The first is that he tested the measurements against a straight line -- not a curve. The second is that the distribution of the errors was not random -- the large errors were in the early years of the measurements, and the most recent had extremely small errors due to the high accuracy with which c can now be measured. Let me at this point make one important clarification. I have no particular expertise in mathematics or statistics -- only that which a general scientific education and interest in the subject would produce in the average reader of this journal who has a broad background grasp of basic science and math. However, even with this low qualification, I could see that Aardsma's approach was unsuitable for these c measurements and contributed an article to the Creation Research Society Quarterly. (5) As it is very pertinent to this article, I will set out the main points as briefly as I can. I tried to show why the method was unsuitable by taking a simple curve (y = x^2) and giving it errors that mimic those of CDK. This was done by making the error equal to (say) 1/10 or 1/100 of its actual value at that point. This gave errors that increased in size as the results were further away from the origin (see Figure 1). By using a simple computer programme various straight lines were checked for their best fit. If the errors were ignored then the best fitting line had a slope value of 7.86x. This straight line can be seen as an average of the curve in Figure 1. If the values are 'weighted' in inverse proportion to the size of their errors, then the slope of the line falls to 5.5x. What has happened is that the higher values with larger errors are reduced in their importance, and accordingly the lower values with their smaller errors increase in the effect they have. If this dominance is increased by using the reciprocal of the square of the error, the slope falls to l.89x. In the actual measurements the difference between the errors is much greater than in this example, for there are many more of the smaller errors which are themselves very much smaller than the larger errors, and furthermore, they are all clustered near the present value for c. As has been pointed out, these early measurements have thereby been relegated to oblivion. It should be noted that virtually all of the early measurements have comparatively large errors compared to later highly accurate measurements. While error bars are not confidence limits, which would indicate statistically significant differences (the latter are generally two or three times the standard errors), the errors are still well above the present value, suggesting that c may have been higher in the past. Those who use this weighted method have effectively reduced their importance to zero. The slope of the line becomes so flat that they can then dismiss it as 'statistically insignificant', that is, there has been no change in c.
In his reply to my article, Aardsma claimed that his 'weighted fit' method 'actually emphasised the decay trend in this artificial data set' (emphasis his). (6) What Aardsma did was to say that my analysis using his method did at least show there was a decrease, even in a case he added that simulated the huge range of errors in CDK data. But he then switched the arguments to another factor, ''the uncertainty of the slope', and claimed that this is so large in his simulated CDK case that CDK can be dismissed, even though it shows a distinct decrease! A weighted regression analysis could be used. However, it must take into account the fact that the large errors are not randomly distributed but are all at one end of the curve. (7) It is this which gives the spurious results when it is ignored. Montgomery has in fact carried out 'a time-dependent weighted regression model with significant fit and statistically significant trend', which he presented at the Third International Conference on Creationism in 1994. (8) Aardsma was present but made no comment on the paper. The basic flaws of weighting with the errors and not fitting a curve in Aardsma's method were pointed out by Norman. (9) He said that Aardsma had used two methods proposed by a statistician (Bevington), but that he had used the first part of one method and then the second part of the other. Had he used one form correctly, Norman claimed that it would have produced a 'floating point exception', that is, it would have 'failed'. He wrote to Aardsma pointing this out, but Aardsma claimed he never received it. In his reply letter, Aardsma (11) protested that his methods were correct. He had written his own programme and this had not 'crashed' as Norman had predicted. The crucial point in Norman's letter is his charge that Aardsma had 'mixed two alternative forms' provided by Bevington in the one analysis to obtain the result he is seeking. How does Aardsma deal with this serious charge? He protested that he didn't 'know where to look' and 'what alternative forms?' Yet Norman's criticism is perfectly comprehendible, and Aardsma only had to say whether or not he used Bevington correctly or incorrectly as Norman claimed. Aardsma replied by making a number of counter accusations, but never answered the crucial criticism that Norman made. Why did he fail to do this? I am concerned that Aardsma used a poor mathematical model in order to undermine the very careful work of Norman and Setterfield. Evered has written several articles critical of CDK. He is extremely disparaging of Norman and Setterfield's accuracy and motivation. His statistical analyses are intricate and difficult for laymen to follow, but it is not always clear whether his method involves weighting the results or not, which I would contend is an important aspect. He quotes Hasofer's paper (12) as supporting his views, and says that it 'compounds the difficulties facing the advocates of the Setterfield theory.' (13) Examining this paper, I could find no such justification for this bold statement by Evered. Hasofer, even though he used a weighted method, found that a linear decrease 'was not supported', but that a quadratic curve was 'highly significant'. An even better fit was obtained with a cubic model. How Evered can claim this paper as supporting his thesis I fail to see. Hasofer notes that the quadratic fit depended upon seven measurements between 1727 and 1771. Evered then proceeds to attack these values to reduce their importance. In one case, the results of 'an immense number of observations' were dismissed by an establishment authority, Newcomb, as having 'been received as a definitive result with a degree of confidence not at all warranted.' Newcomb gives no reason why this value should be dismissed, but this is sufficient for Evered to quote him to cast doubt on their accuracy. I have shown in a letter to the CEN Technical Journal (14) how Bounds similarly dismissed many 'unwanted results' giving no reasons whatsoever. Hasofer's quadratic fit is dependent upon the early measurements in the 1700s. Critics of CDK claim that Chaffin's work (15-16) has cast doubt upon their accuracy, and therefore Hasofer's other calculations indicating no change support their case. We will examine Chaffin's work later and demonstrate that, far from supporting their case, these early measurements actually show that there has been a decrease. Hasofer's important quadratic fit cannot therefore be dismissed. Evered added that the original workings were not kept, and therefore cannot be checked. But how many early results in many fields of study have complete records available that would enable a full check to be carried out? What the method is used for is where the data have varying errors randomly distributed along their distribution, and the results are roughly a straight line -- which may be sloping. What it is not suitable for is the CDK-type data where the results are curved and the larger errors are all at one end. Hasofer's analysis may be weighted, but does find significance when applied to a curve. I will not criticise other weaknesses of some of Evered's lines of argument, as the whole subject of complex statistics can involve other factors, as we will see. The overall effect of his many criticisms is to make Norman and Setterfield appear as not just incompetent, but deliberately distorting the available data to support their theory -- a matter we examine below. Another critic checked the speed of light today and then examined Roemer's data. (15-16) One factor discussed in these calculations was the speed of lo around Jupiter --one researcher said it was slower, another that it was faster! (15) Using the present value it gave a value for c that was 6.7 per cent higher than today! Using a slightly faster orbital speed, it gave a 'worse'(?) value of 16.7 per cent higher. Using the slower value gave no difference compared to the present value of c.
The use of the word 'worse' for a scientific result suggests that it did not give the result that the investigator was looking for! In addition, I fail to see how a slight change in the rate of Io's orbit over a few hundred years could change the final value of c. All that is required is for Io's orbit to be sufficiently regular during the few months of each series of observations. The period can be quite different for another set of timings -- provided the gradual variation of the periodicity due to the change in distance from Jupiter can be accurately measured. Agreed -- but we have no right to assume that the results of research may be wrong simply because they do not support our views. If you are allowed to stretch any suitable factor sufficiently, you can get any result you are striving for! In another paper, (17) determinations of c over many years using Bradley's measurements were examined. The conclusion drawn was that c 'was not significantly larger than today 's value'. However, the computer programme could vary c to obtain the best fit to the data. When this was carried out, it gave a speed for c that was 2.4 per cent larger than today. This seems to have been unacceptable, so the results were dismissed with the comment 'Bradley's data are not accurate enough . . . I conclude that Bradley 's data are consistent with the modern value for the speed of light'. Now it is obvious that Bradley's method is not a very accurate way of measuring c, but it was sufficiently accurate to demonstrate a clear trend of decreasing c. It is unacceptable to dismiss the results because of the 'inaccuracy' of the method. That the method is not as accurate as several others was a known fact before the investigation was started. We have referred to these three papers for they have been quoted by several creationists as proving there has been no change in c. Had they examined them more critically, the fact that the data actually supported CDK and did not support the writer's conclusions should have been obvious. In reading the articles on CDK, the high level of statistical analyses that are employed is impressive. The advanced levels are well above my knowledge to fully comprehend, and I would suspect that this would apply to the majority of readers. What is the layman to do when experts disagree? I suggest there are two things. As the subject is very technical, one of them is to examine the credentials of the people involved. It seems to have escaped the notice of the critics that there are four experts who have concluded that there is a decrease in c -- Norman, Montgomery, Durroch and Hasofer, and all have qualifications or specific experience in statistics. Norman took the data to Dr Durroch, the head of the Statistics Department at Flinders University, without identifying them as related to the speed of light. He carried out an independent analysis and agreed with Norman and Setterfield's conclusions. When he was told became very excited and arranged for Norman to give a department seminar on the subject. In contrast, the statistical analysis that says there has been no decrease is the very faulty 'weighted regression' fit to a straight line. I have never seen Aardsma or Evered make any claim to a knowledge of statistics which could match that held by the four experts referred to above. It would appear to me that those who consistently use the weighted regression' method are specialists in other areas of science to which mathematics is an adjunct discipline and statistics an even more specialist area. Those who are specialists in statistics support Norman and Setterfield's claim that the data points exhibit a statistically significant decay trend. It will be noted that in my list I have included Hasofer, as I do not consider that Evered has any right to claim him as a supporter of his work. Are there any statistical specialists that the CDK critics can quote as agreeing with them to equalise the balance? I could not find any. Evered does his best to overcome this difficulty. He asked four former working colleagues who are expert in the field',' (18) all of whom agreed with his method. Did any have expertise in statistics? We are not told, but one might have expected Evered to mention this if it supported his case. Why did he not give their qualifications? We are not informed how the discussion went, how the various questions were worded, etc. Had any pro-CDK author used such evidence it can be imagined how Evered would have dealt with it. What is Evered's idea of an 'expert in the field' of statistics? Can this be discovered? I think it can. In one of his papers'9 he refers to his son Mark as 'an expert in the subject'. In an earlier paper20 he acknowledges the assistance of his son who is 'a computer scientist and mathematician'. Now this does not include any specific expertise in statistics, the very technical subject that is under discussion. It would therefore appear from the evidence that Evered has produced that no qualified or expert statistician gives him any support whatsoever for his faulty method of analysis. If I am wrong, I am sure he will be quick to correct me. I have said that one of the things the layman can do when experts disagree is to examine the qualifications of the experts. I would not generally advise this as it is all too easy to be 'blinded with science' by experts. In this case, however, the real experts all seem to agree about CDK. The second recommendation I would make is to apply a degree of common sense. Try to imagine that scientists want to measure a phenomenon that has a constant value -- let us say the speed of sound rather than light. Early attempts would be crude and well off the actual value as clocks would be inaccurate, distances difficult to measure accurately, wind effects not allowed for, etc. Over the years, several experts present their values, which vary over wide limits. As the years pass, the measurements become increasingly refined until a very accurate measurement is finally established. What would the graph of all these results look like? It would surely have the basic pattern as shown in Figure 2. This is the typical 'funnel shape' to which the results gradually tend, with roughly as many results above the line as there are below it. Now look at Figures 3 and 4, which are taken directly from the Stanford Institute Report by Norman and Setterfield. (3) It will be immediately apparent that they do not look anything like Figure 2. It is this broad consistency of the majority of the readings to be above the present value for c that surely indicates even to laymen that c was higher in the past, and furthermore, that it was decreasing on a curve. You do not have to be an expert in statistics to appreciate this fact. With the four main defendants (Norman, Setterfield, Dolphin and Montgomery) drawing almost all the fire, in the heat of the battle the critics appear to have overlooked the fact that the secular scientist Troitskii, 21) using a completely different approach, had arrived at exactly the same conclusions that CDK could have occurred and that the speed of light could have once been of the same high order of magnitude faster -- 10^10 x c.
If the critics want to completely demolish all the evidence for CDK, then they will have to answer this paper also. In writing my Science vs. Evolution, (22) I had to read many books by evolutionists and began to see the flaws in their arguments and logic. It was with considerable sadness that I could see the antagonists of CDK using some unjustifiable methods of arguing. Numerous papers have been published in support of CDK, it was initially discussed and promoted by the Stanford Research Institute, and it has been discussed with little criticism at the prestigious Batelle Institute after Lambert Dolphin gave a lecture. In view of these presentations, Evered's claim that there is virtually no evidence in support of the theory requires considerable flexibility of mind. This is surely an unacceptable insinuation. Evered uses methods that are unacceptable to qualified statisticians and then claims it is the opposition who are 'manipulating 'the data. Aardsma's contributions also are not free of 'loaded' phraseology. It has already been pointed out that he protests most effusively about Norman's accusations, but fails to answer them. 'because of legitimate analytical and scientific concerns, Norman and Setterfield's version of the decay of c hypothesis is all but dead' (emphasis mine). How he can claim this in the face of the evidence provided I fail to see. 'To refresh everyone's memories, so as not to be led astray. If we pause here, it might be asked, 'Who is leading who astray?' A review of the evidence does not of itself lead anyone astray. This phrase is without meaning in this context, but what it does do is to leave the reader with the inference that Aardsma's evidence must be attended to carefully or the reader will be 'led astray' by evidence provided by the opposition which should therefore be ignored. This ploy is known as 'special pleading' in the law courts. What is of concern is the lack of recent papers rebutting the accusations of Evered, Aardsma and others. Does this mean that CDK'ers have retired wounded to their corner or fled the battlefield in defeat? This is certainly the interpretation that many are beginning to arrive at. I would suggest that this is unwarranted. I understand that although CDK supporters have been invited to write articles there has been little response. This sounds damaging -- but from my correspondence with some of the protagonists I suggest that the main problem is one of time. (a) Although there have been many papers supporting CDK, there appear to be more against the theory. (b) There are more creationists who have written against CDK than for it. (c) Flaws in the theory and data have been pointed out by the critics, both creationists and secular. (d) In the last few years, papers have been published that have not been answered by the pro-CDK camp. (e) Despite being asked to reply, they have failed to respond with a substantial article. From all this, many will have concluded that CDK is truly finished as a viable theory. But now look carefully at this list again. Not one of these statements can be held as 'proof' that CDK has never occurred. This can only be determined by an examination of the quality of the arguments put forward by each side, not by the quantity or manner of presentation. The CDK supporters have given as much evidence as they can, but still the critics cannot or will not see the flaws in their case. The critics have rightly made the supporters 'tighten up' their evidence, but the critics have refused to admit to any errors. If the many articles are reconsidered in the light of all the above, and all papers are read with a degree of critical care, I am confident that it will become obvious that CDK well and truly remains a viable (I would say proven) hypothesis. 1. Evered, M. G., 1993. The recent decrease in the velocity of light--what decrease? CEN Tech. J., 7(t):93--l02. 2. Evered, M. G., 1995. The velocity of light: constant yesterday, today and tomorrow. CEN Tech. J., 9(l):102--105. 3. Norman, T. and Setterfield, B., 1987. The Atomic Constants, Light and Time, Invited Research Report, Stanford Research Institute, Menlo Park, California. 4. Aardsma, G., 1988. Has the speed of light decayed recently? Creation Research Society Quarterly, 25(1 ):36--40. 5. Bowden, M., 1989. The speed of light -- a critique of Aardsma's statistical method. Creation Research Society Quarterly, 25(4): 207--208. 6. Aardsma, G., 1989. A response to Bowden. Creation Research Society Quarterly, 25(4):208--209. 7. The regression analyses of CDK critics can be legitimately criticised where weighted analyses have been used, not because weighting is wrong (it is, in fact, very appropriate), but because legitimate regression analysis depends upon each value of the independent variable being equally represented with a dependent variable. If a time-dependent regression is loaded with many values from one particular time, the analysis will tend to obscure any time trends. In the case of COK, there are many more recent values of c available than the earlier measurements. 8. Montgomery, A., 1994. A determination and analysis of appropriate values of the speed of light to test the Setterfield hypothesis. In: Proceedings of the Third International Conference on Creationism. R. E. Walsh (ed. ), Creation Science Fellowship, Pittsburgh, pp. 369--386. 9. Norman, T., 1991. velocity of light decay: a mathematician's response. CENTech.J.,5(2):108--112(p. Ill). 10. Norman, Ref. 9, p. III. 11. Aardsma, G., 1992. The velocity of light. CEN Tech. J., 6(l):90--92. 12. Hasofer, A., 1990. A regression analysis of historical light measurement data. CENTech.J.,4:191--197. 13. Evered, M. G., 1992. Further evidence against the theory of a recent decrease in c. CEN Tech. J., 6(l):80--89 (p. 83). 14. Bowden, M., 1994. The speed of light -- a critique of Bounds' methodology. CEN Tech. J., 8(2): 156--158. 15. Chaffin, E., 1990. A study of Roemer's method for determining the velocity of light. In: Proceedings of the Second International Conference on Creationism, R. F. Walsh and C. L. Brooks (eds). Creation Science Fellowship, Pittsburgh, Pennsylvania, vol. 1, pp. 47--52. 16. Chaffin, E.. 1992. A determination of the speed of light in the seventeenth century. Creation Research Society Quarterly, 29(3):l 15--119. 17. Chaffin, E., 1994. Are fundamental constants of physics really variables? In: Proceedings of the Third International Conference on Creationism, R. E. Walsh (ed.). Creation Science Fellowship, Pittsburgh, Pennsylvania, pp. 143--150. 19. Evered, M. G., 199t. Is there really evidence of a recent decrease in c? CEN Tech. J., 5(2);99--104. 20. Evered, M., 1991. Computer analysis of the historic values of light. CEN Tech. J., 5(2):94--96. 21. Troitskii, V 5., 1987. Physical constants and evolution of the universe. Astrophysics and Space Science, 139:389--411. 22. Bowden, M., 1991. Science vs. Evolution, Sovereign Publications, Box 88, Bromley, Kent, BR2 9PF, England, p. 223. 23. Evered, Ref. 13, p. 88. 24. Norman, Ref. 9. p. III.